Topps Inc. and WizKids Inc., makers of the hit collectable miniatures game (CMG) MLB SportsClix, announced that the charity auction for the Babe Ruth Masterpiece Figure netted $1,325 for the Boys and Girls Club of America. 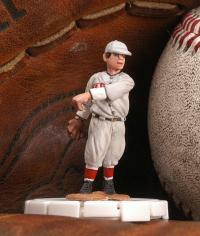 The figure is well-known, as it features Babe Ruth in his 1917 Red Sox uniform - only two years before the "Curse of the Bambino" struck Boston! Chris Hart, the WizKids painters who completed this piece, finished putting Ruth back in his Red Sox uniform on October 20th - the night of the Sox' historic Game Seven victory, when the "Curse" was finally put to rest! "We couldn't be happier that this historic game piece brought in so much for the Boys and Girls Club," said Mike Samora, Vice-President of Marketing at WizKids. "It shows just how much our fans are willing to help others." The Babe Ruth miniature, one of only fifty hand-crafted pieces made, is hand-numbered #1 of 50 and comes with a Certificate of Authenticity from Beckett. This auction was the first chance to purchase a piece from the MLB SportsClix 2005 set, which releases in April of 2005.